Yoga has taken the world by storm, and has gained steadily in popularity over the last decade. Originally developed thousands of years ago, the practice of breathing, posing, and stretching offers a variety of important health benefits. Reduced stress and blood pressure, increased flexibility and stamina, greater balance, and a better understanding of breathing techniques are all fabulous results of practicing yoga. In addition to the normal exercise benefits yoga offers, the practice serves as safe exercise for patients with a variety of injuries and health conditions. For my patients that practice Yoga regularly, they feel it helps link the physical, emotional, and spiritual wellness all together. for patients with a variety of injuries and health conditions. For my patients that practice Yoga regularly, they feel it helps link the physical, emotional, and spiritual wellness altogether. Although the three disciplines come from entirely different histories, the similar foundations of yoga, chiropractic care, and massage therapy offer enormous benefits to those suffering from a variety of injuries and conditions that seek help in our office. By incorporating yoga sessions into their treatment, our chiropractic patients often reap great rewards when they finally achieve fulfilled wellness. Practicing yoga stretches and elongates the body’s muscles, releasing tension and stress. 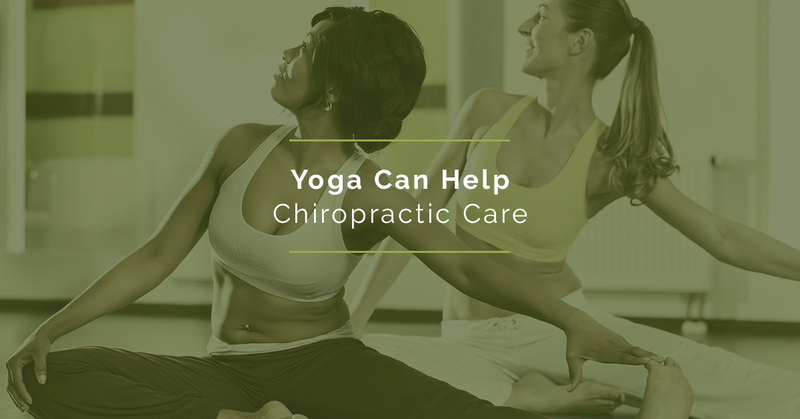 Before patients visit their overland park chiropractor, yoga can serve to warm up their bodies and clarify their minds, so the chiropractor can dig into the root problem. Yoga complements chiropractic and massage by readying the body to heal itself. Dealing with a health condition or injury is frustrating and can seem like it takes forever to heal. (Frustrating!) Implementing yoga into a recovery plan helps strengthen joints and ligaments, which aids in promoting healing and cutting down the time it takes to get better. Yoga works on the body as a whole and promotes greater well-being from head to toe. A stronger body absorbs chiropractic and massage therapy more productively and deeply than one that is stiff, sore, and unhealthy. Yoga sessions increase a body’s flexibility and help with the range of motion in the neck, back, hips, and other joints. Many reasons individuals seek chiropractic and massage therapy treatment are for recurring issues. Yoga provides an ongoing way for patients dealing with chronic issues to manage and reduce instances of pain, inflammation, and other symptoms. A regimen of yoga coupled with chiropractic and massage therapy keeps the body aligned, its balance level, the muscles stretched and de-stressed, and the joints operating efficiently. All three (done correctly!) serve to keep posture correct, and ligaments strong. All of these create a body that is less susceptible to future injury, and less inclined for previous medical conditions to resurface. Yoga has long been touted as the answer for many of the body’s issues, and it’s smart for individuals, whether dealing with current issues or in prime health, to check out the basics of yoga. Chiropractic care, medical massage therapy coupled with yoga offers a great many benefits to our patients who are dealing with medical conditions or injury. Ask your overland park chiropractor or massage therapist for an evaluation of your health issues, and whether adding yoga to your overall health plan would help you lead a better, more active life. Get in touch with our chiropractic clinic today! If you are looking for a health care team with amazing chiropractors, a massage therapist, and a wonderful staff to help you find your overall wellness, give us a call at 913-681-7757.